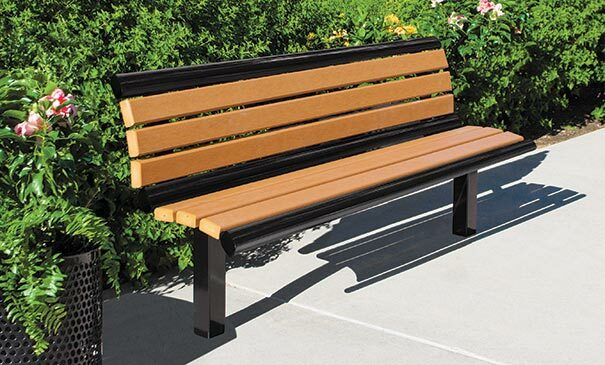 Elevate the outdoor appeal with a 6' park bench from the Richmond Recycled Collection. The impressive stylings of this collection combines recycled plastic with powder-coated steel to create an upscale look that is ready for a variety of environments. With a notable flair the bench seat with backrest offers modern style and comfort, featuring six slightly contoured recycled plastic planks framed by 3 oval steel tubes. Models are configured for in-ground or surface mount installations—the 3" square 11-gauge steel tube frame provides reliable support and is engineered for continued exposure to seasonal elements. Create a cohesive setting with the Richmond Recycled Collection offering matching backless benches, picnic tables and multi-pedestal tables.